Sabudana khichdi is a light snack which can be enjoyed for breakfast, lunch or even for dinner. 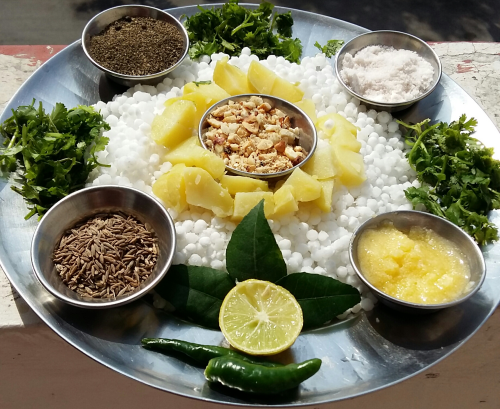 Sabudana khichdi is especially made on festivals such as Mahashivatri, Ekadashi, Janmaastami and during Navratri. Wash sabudana until water runs clear. After 4 or 5 hours, sabudana will becomes fluffy. If there is any excess water drain it. This is important to avoid stickiness. Cut boiled potato in small cubes, chop green chillies finely and grind groundnuts coarsely. Preferably use a non stick pan to make khichdi, because sabudana sticks very easily. Heat ghee in a pan and add jeera. When jeera sizzles, add curry leaves and green chillies, stir it for a few seconds. Now add sabudana, potato cubes, coarsely grounded groundnuts, sendha namak and pepper powder, mix properly and let it cook on medium flame untill sabudana becomes translucent (it takes 5 to 7 minutes). Switch off the flame, add lemon juice and some coriander leaves, mix properly. 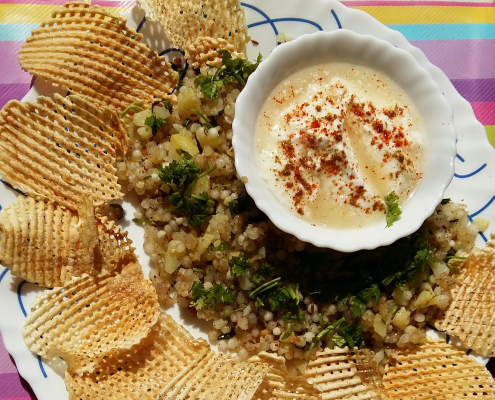 Serve hot sabudana khichdi with dahi and home made potato chips.